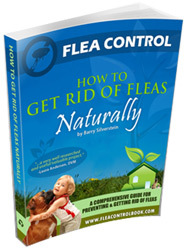 There are many commercial products available to prevent, control, and kill fleas, but the majority of these products contain unsafe, harmful ingredients. In fact, most commercially available pesticides contain toxic chemicals. Often these ingredients are toxic to the very animals they are supposed to protect – and can even do harm to you and your family. The EPA did ban six types of organophosphates from the pet products market because they were found to be extremely harmful to pets and children. The banned substances are: chlorpyrifos, dichlorvos, phosmet, naled, diazinon, and malathion. One organophosphate has not yet been banned: tetrachlorvinphos (TCVP). Be certain you avoid pet products with any of these ingredients. Carbamates, another dangerous class of chemicals, should also be avoided. Note that cats are particularly sensitive to the adverse effects of pyrethrins and pyrethroids (synthetic versions of pyrethrins). If products with these ingredients are used on dogs with cats in the home, cats can still be exposed to toxicity.